Purple text and links added by Tom Sloper. "Are my tiles Bakelite, Catalin, vinyl plastic, bone, ivory or what?" Bakelite -- Bakelite is the most common material used in older American-made plastic Mah Jongg tiles. It was the first truly synthetic plastic and was developed and patented by Leo Baekeland in 1907. It was made from a mixture of phenol (carbolic acid) and formaldehyde. It is a thermoset plastic -- once it has been formed and molded with heat and pressure, it cannot be melted down again. Most Bakelite tiles are a yellow-orange in color (some would say "butterscotch"), but other colors are known, especially in two-tone tiles. The tiles are opaque, very dense and usually have fairly sharp edges. Bakelite wasn't widely used to make mah-jongg sets in the 1920s, when mah-jongg was a craze (see FAQ 11). Bakelite became most widely used during the 1930s, when the Great Depression created a need for cheap manufacturing materials. Tom says: I strongly advise against performing any tests which might permanently discolor or leave a mark on a mah-jongg tile. Nobody should scrub or stab their tiles to try and figure out what they're made of - it's just not necessary. Accordingly, I have deleted some information that used to be here on this site. Click here to learn more about the plastics used in mah-jongg tiles! And you can learn more about bakelite and catalin at http://www.decoradios.com/text.htm#bakelite (thanks to aurelio247 of the now-defunct eBay MJ group). There used to be an article at deco-echoes.com, but my old link no longer functions. For more info on the history of bakelite, see http://www.mbzponton.org/valueadded/maintenance/bakelitehist.htm. Catalin -- Catalin is another phenol-formaldehyde plastic developed as a competitor to Bakelite. [Deleted] Some collectors say that Catalin tiles are more rounded from a difference in the molding process, while Bakelite tiles are sharper-edged. Some collectors also say that Catalin tends to be more translucent (at least less opaque) than Bakelite. Sets which contain Catalin tiles include those by Cardinal and A&L Mfg., or may have a Royal Depth Control (RDC) Catalin label in the box. Click here to learn more about the plastics used in mah-jongg tiles! Celluloid -- Celluloid was the one of the first man-made plastics, having been developed by John Hyatt in the 1860's. It was made from cellulose (usually from cotton shirt manufacturing waste) and camphor. It was developed as a direct substitute for ivory and tortoiseshell. Early celluloid was extremely flammable and burned with the smell of camphor and nitric acid. We have seen some tiles that are reputed to be celluloid, but have not been able to verify them**. 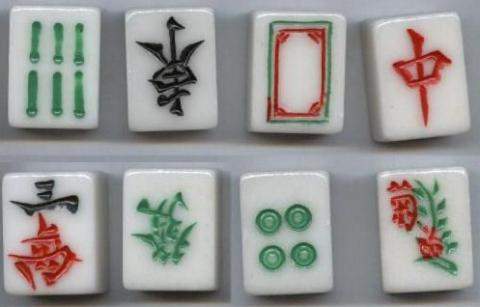 It is unlikely that many Mah Jongg tiles were made from celluloid, since it was more expensive to produce than the other plastics by the time Mah Jongg tiles were being mass manufactured. ** Tom adds: I have seen a set in which the tiles looked like the one pictured here. The distinct grain of "French Ivory" was evident. I did not attempt to discern a camphor smell, however. Alternate names for celluloid are "French Ivory" (due to the striated appearance) and "Pyralin." Click here to see the "Is It Ivory" checklist! A celluloid tile. Notice the fine vertical lines, created to make the tiles look like ivory -- which is why celluloid of this type was referred to as "French Ivory" -- but the grain is too regular to be ivory. Bone -- Bone is by far the most common material used in antique Chinese Mah Jongg sets, and it is usually dove-tailed with bamboo. [Tom adds: Most bone mah-jongg tiles are made from ox or cow shin bone, but it is possible that bone of other animals may have been used as well. We don't have any definitive information on how to distinguish cow bone from elephant bone, but American cow shin bones (bought in Chicago and shipped to China for making mah-jongg tiles) were bleached, and Chinese cattle shin bones were not. Darker, dirtier-looking bone is likely Chinese bone, not American bone. I don't think any tiles were made from elephant bone, but in any case it's likely that it's illegal to import items made of elephant bone - see the alert below.] Bone is often mistaken for ivory. Bone tiles will usually show somewhere, even if only a few tiles, the Haversian system found only in bone. This is the remnants of the vascular system of the bone structure, and usually shows up as small pores, often darkened with decayed organic material. The Haversian system may also show up as streaks on the tiles. Ivory does not have this system, so any indication of the Haversian system is a strong indication of bone. If in doubt, assume the sets are bone, not ivory. There is a good economic reason for this, as well: when these sets were made in the 1920s and 1930s in China, China was in dire economic straits in its ongoing conflict with Japan. It is very doubtful that ivory could have been afforded or imported during that time. TEST: Visually look for signs of the Haversian system in ALL of the tiles of the set -- in high grade bone sets, this may be difficult to find and using a 10x hand lens is helpful. If you have questions about cleaning or restoring bone tiles, see FAQ 7o. FISH BONE: A lot of newer modern sets, especially those coming from Shanghai, are made of pulverised fishbone, reconstituted and pressed together. COLOUR: because the bone is presumably bleached in the process, the tiles are extremely (pristine) white, with of course: no evidence of Haversian system. The actual paint used in the symbols on modern (fishbone) sets are usually much brighter, bordering on gaudy, garish colours. SHAPE: because they are reconstituted (rather than carved from solid bone), they are very uniform in shape with very flat, even surfaces, without signs of filing/sanding and the dovetails are very uniform in shape and size. Fishbone tiles also have very sharp edges which sometimes show very fine chipping of the edges. CARVING: Unlike older tiles, carved from solid pieces of bone, modern tiles are increasingly "carved" (engraved) with modern, presumably electric, tools. Such engravings show very rounded curves. Older carvings were chiseled or gouged and rounded corners tended to be angular, as a result of being done with two or more 'strokes'. Thanks to Peter Gallagher for adding the above information to Sandy's tremendously useful FAQ. -- Tom. NOTE: Be advised that some countries (like the United States) prohibit the importation of ivory items (or any items made from endangered species like elephants). In 1989, the U.S. banned imports of ivory items. In 2014, the U.S. instituted a ban on interstate sale of ivory items, and made it illegal to sell ivory items without a permit that can be obtained only by proving the items' provenance. So if you live in the United States, don't buy any ivory or elephant bone items from any other country or state! Cow bone, walrus ivory, and mammoth ivory should be okay to import (eBay has a guide about what items should not be imported). Top tile showing Haversian system w/ streaking. Bottom tile from same set, showing no Haversian system. If you see a straight grain and/or pores on any of the tiles in a set, they are BONE. Note also older-style "crak" character typical of antique tiles from the 1920s. See FAQ 7e. Two tiles from a fishbone set. 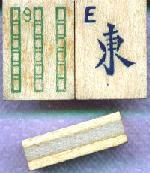 These new fishbone sets use the later style of "crak" character (shown), and often have Singapore-style flower tiles such as cat, rat, rich man, pot of gold, fisherman, fish (not shown) and Chinese "100 Uses" jokers (shown). Ivory -- Some collectors feel that there are very few, if any*, true ivory Mah Jongg sets in this country. Ivory is best identified by an expert, but there are some indicators of true ivory. Ivory has a visual "depth" not seen in bone. TEST: A visual inspection of ivory under strong light will usually reveal some of the tusk structure. The most definitive pattern is described as looking like "stacked chevrons" or a "cross-hatch" pattern somewhere in the tile (often at the edges), barely seen as the tile is turned in strong light. Other patterns are wavy (indicating the layers of the tusk). NOTE: This website takes a skeptical view of sellers claiming that they have ivory items for sale. As noted above, ivory mah-jongg sets are rare. They are therefore more valuable than bone or plastic sets. Make sure of what is being offered before you buy. Also be aware of the law. In 2014, the U.S. instituted a ban on interstate sale of ivory items, and made it illegal to sell ivory items without a permit that can be obtained only by proving that the items were imported to the U.S. before the 1989 import ban. The 2014 ban also prohibits selling ivory items across state lines. So if you live in the United States, don't buy any ivory or elephant bone items from any other country or state! * Tom says: I own two genuine ivory sets, so I struck through the "if any" in the above. These are the first ivory tiles that we have identified that are dovetailed with bamboo. They show the curvy grain of ivory on the front and the "stacked chevrons" or cross hatching on the sides. These tiles were verified as ivory by a senior appraiser of orientalia. They are the only ones we know of in the US. If you have pictures of others, please send them to the Webmaster. Wood -- In some less expensive Mah Jongg sets, the tiles were made of solid wood. Types of wood vary, and they may be solid wood or laminated (shown) but visual identification is usually easy. Wood tiles are flat on both sides. These have some value to collectors. The tiles may be carved and painted directly on the wood, or may have paper or plastic stickers on them. Bamboo -- Also used in less expensive sets, primarily Chinese sets, is solid bamboo. These tiles are cut from bamboo and usually have a curvature to both sides, reflecting the structure of the bamboo. They may be the natural color of bamboo (shown), or they may be painted, generally black with bright designs. Again these are collected more as a curiosity, since they are difficult to play with. Composition -- Some American companies (notably Parker Brothers) produced inexpensive sets using composite wood with paper or plastic fronts. When these sets are in "mint" condition, they have value to collectors. Vinyl Plastic -- Modern American sets are made of vinyl plastic and usually white with brightly colored stamp-painted faces. Collectors of older set find these bright tiles somewhat garish. But these may be the only sets that have all 8 jokers (without the need for stickers) for current American-style play. Typical "modern" plastic set being sold today. Jade -- Jade sets exist but are somewhat rare. In the examples I have seen pictured, the tiles are entirely made of jade, with the symbols carved into the face, undoubtedly by hand. Expect these to be pricey! We usually think of jade as being green, but I haven't seen any green jade mah-jongg tiles yet. To date, I have only seen them in "black jade" and "white jade" (nephrite). White jade tiles. Click the picture for a closer view! An example of a dark jade tile (from the collection of the same collector who owns the ivory tiles shown above). Kelley and Schiffer, Plastic Jewelry, Schiffer Publishing, Ltd., 1996. Copyright 2000-2015 Tom Sloper, Sandy Beach, and others as credited. May not be reprinted without express written permission of Tom Sloper. All rights reserved.